My mother-in-law knows how much I love to share easy recipes on my site and how much I firmly believe they are essential for busy moms. She is always sharing a new food idea with me. Over the summer she and my father-in-law made their annual summer trip to New York to visit family. They were both born in New York as well as all of their children. They moved to Texas in 1968 when my husband was a year old. While they were in New York this year her sister-in-law shared this easy recipe with her and she came back to Texas and shared it with me. Can I just say this was delicious? And, don’t let the name baffle you. There is absolutely no Vodka in this recipe. I mixed the pasta, sauce and chicken all together in the final steps. When the recipe was explained to me, the chicken and sauce were served over the pasta. You can do it either way. 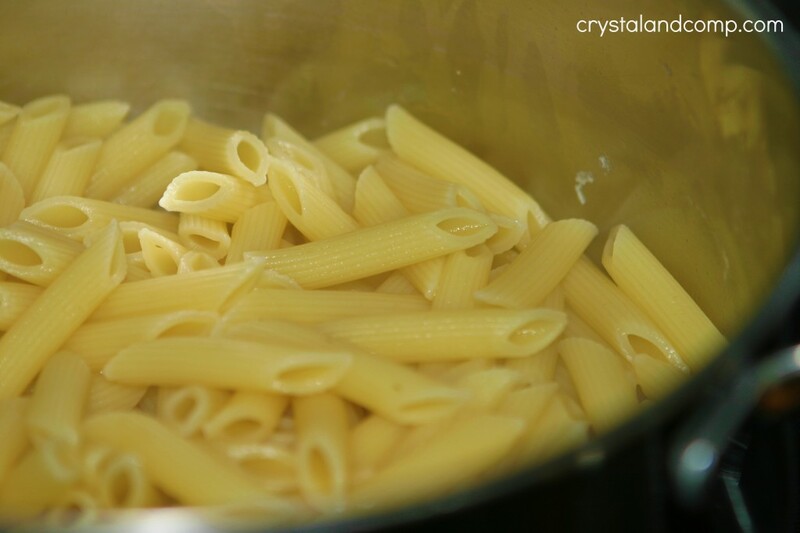 Fill a large pot with water and bring it to a boil for the pasta. Meanwhile, add the oil and garlic to a skillet. Over medium heat saute the garlic. 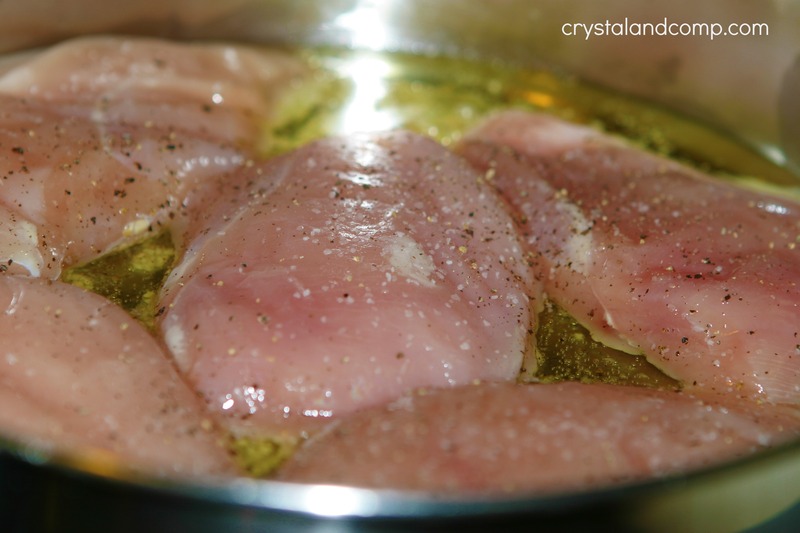 Sprinkle salt and pepper on both sides of each chicken breast. 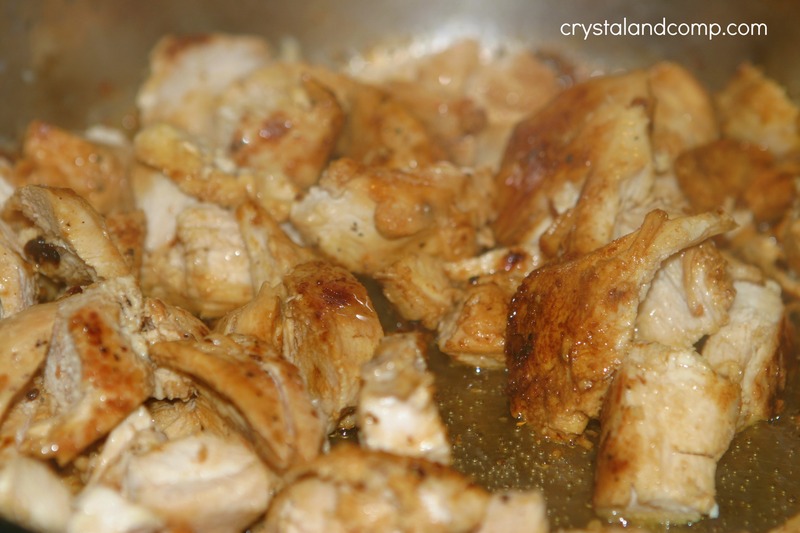 Place the chicken breasts in the skillet and brown on each side for 4-5 minutes. Once they are brown on each side, dice them up. I just do this in the skillet. 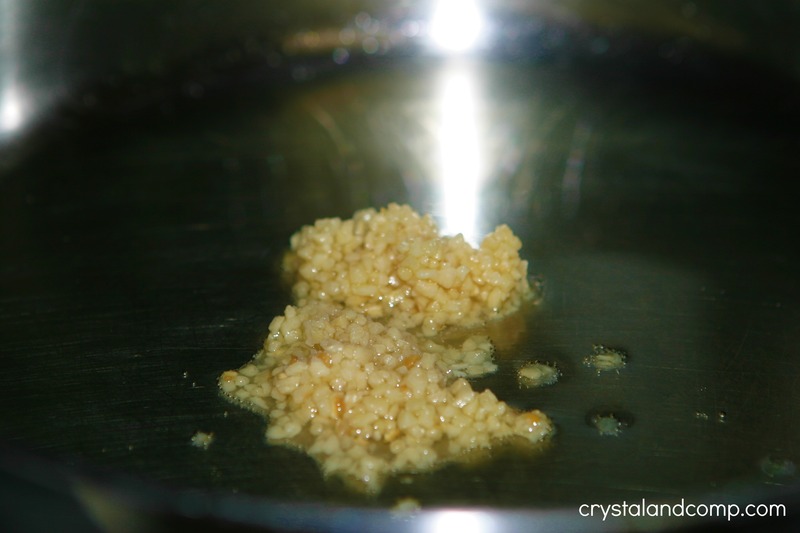 Continue to cook them over the medium heat until they are 100% cooked through. 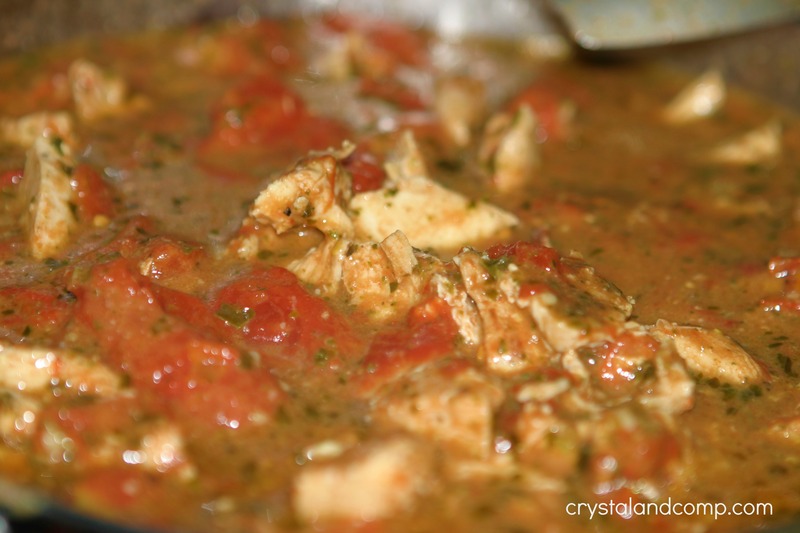 Add in the can of whole tomatoes. 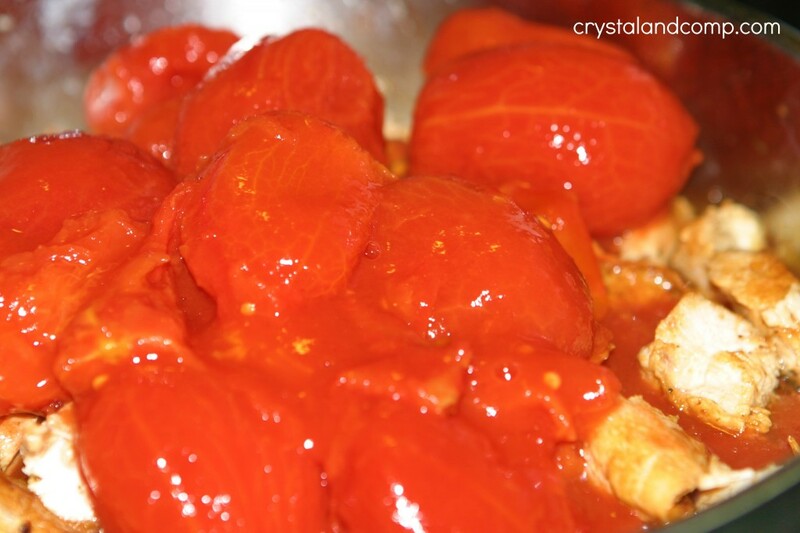 Use your large mixing spoon to roughly dice up the tomatoes. Cook for another 1-2 minutes. 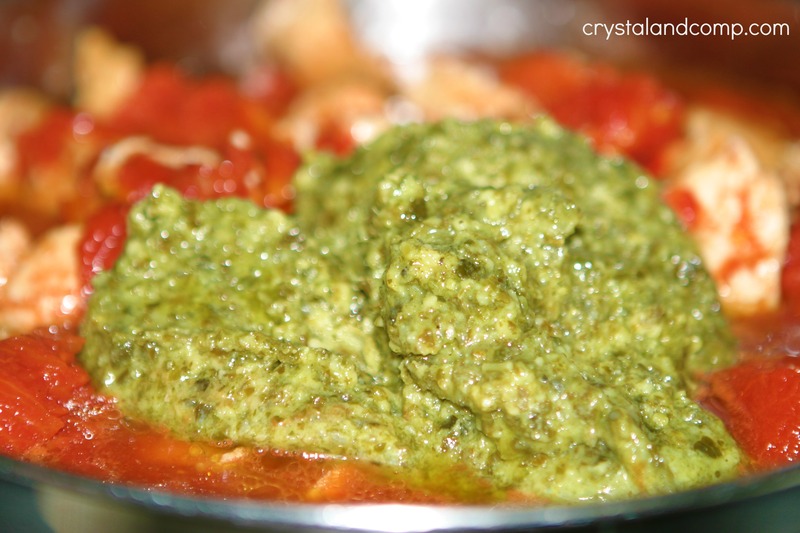 Add in the container of pesto. Cook for another 1-2 minutes for everything to combine well. Reduce heat to a simmer for about 10 minutes or so. The sauce will being to reduce. Add your pasta to the boiling water. Cook the pasta for about 9 minutes. 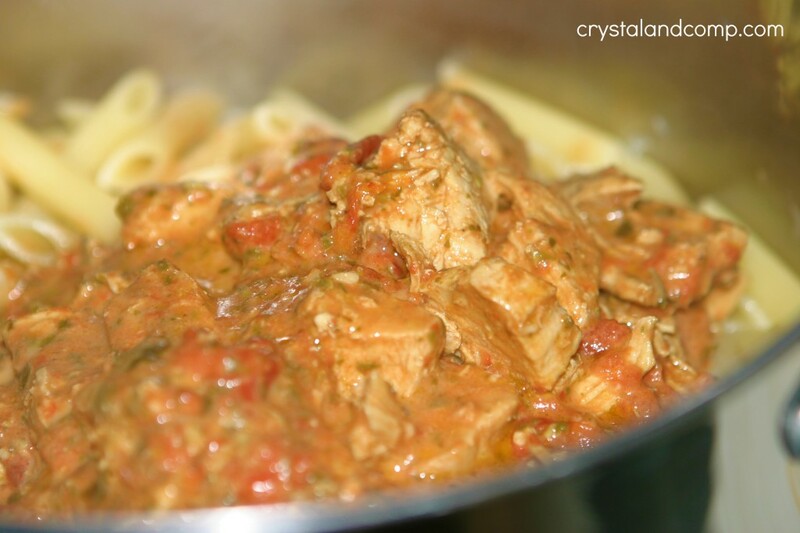 Dump the chicken mixture onto the pot with the pasta. Stir to coat the pasta well. Stir to mix well and coat. We served it with a dinner salad and rolls. Add the oil and garlic to a skillet. Over medium heat saute the garlic. Stir well to combine. Cook for another 1-2 minutes. Add in the container of pesto. Stir well to combine. Add the heavy cream. Stir well to combine. Add your pasta to the boiling water. Cook the pasta for about 9 minutes. Drain. Return to the pot. 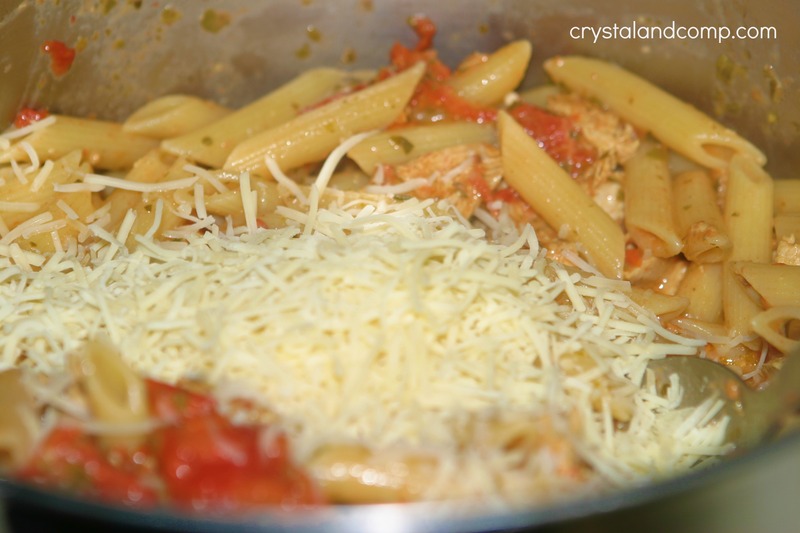 Dump the chicken mixture onto the pot with the pasta. Stir to coat the pasta well. Add the cheese. Stir to mix well and coat. Plate it up. We served it with a dinner salad and rolls. Yum! Vodka sauce is one of my favorites. My husband does not like chicken. 🙁 Please make this and invite me over to eat!! 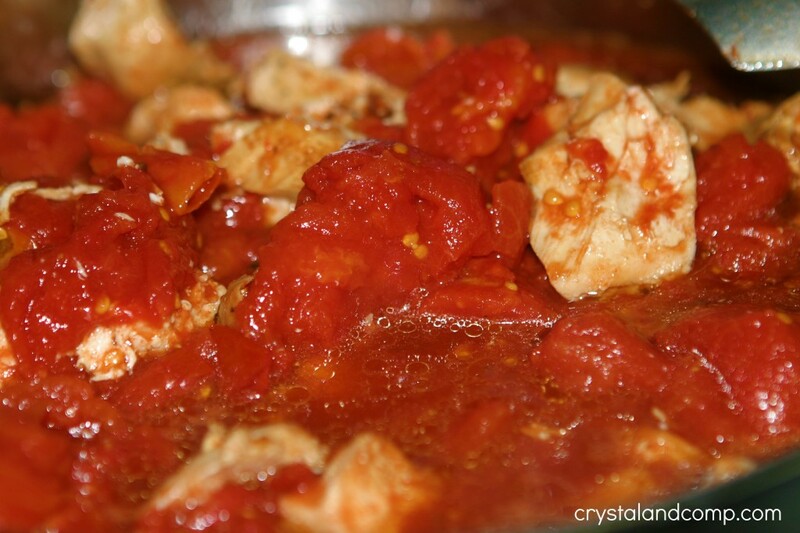 So glad you posted this recipe! 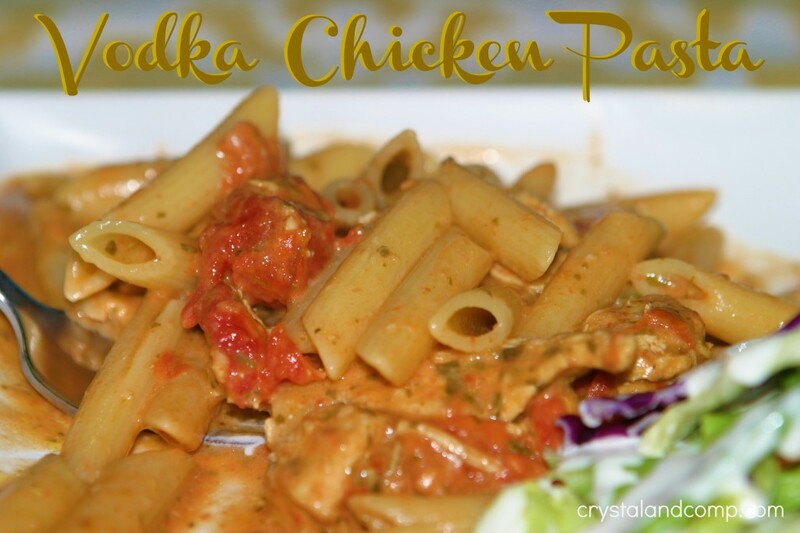 Just last week I made a different version of vodka pasta and it took forever. I can’t wait to use your recipe…MUCH better plan!! Awesome Sharon! Enjoy… it sure is yummy. Beautiful dish, Crystal, and so healthy! I make something similar and include saute-ed sliced peppers, mushrooms and zucchini. Yummy! Thanks for sharing! That looks fantastic and I appreciate that there is no vodka in it. This looks so yummy! I’m pinning it, so I can make it next week. Thanks for sharing! That looks wonderful! 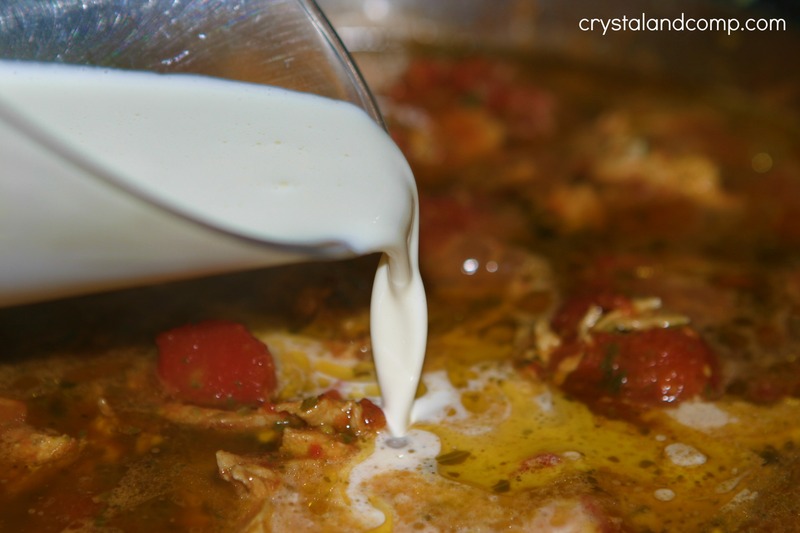 This is a great recipe to try! I found you on We Like to Learn as We Go Wednesday. 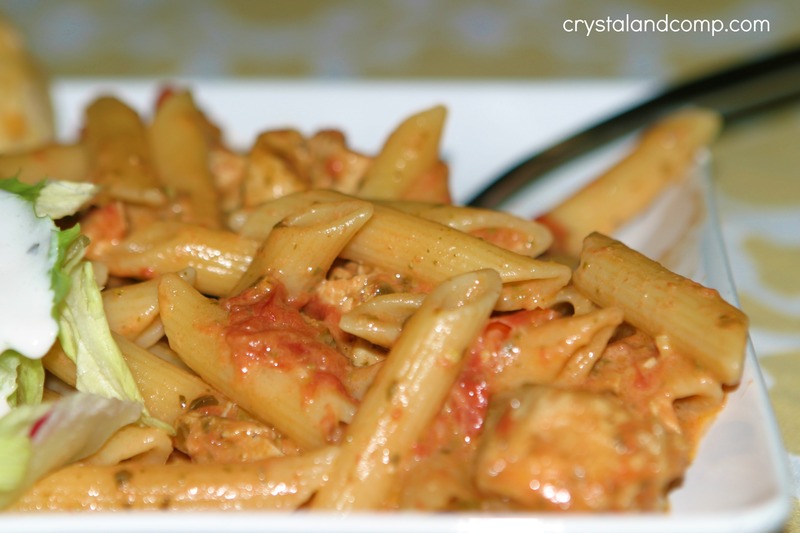 This looks like a great Chicken Pasta that we would just love. Enjoy your weekend and thank you so much for sharing with Full Plate Thursday. Miz Helen- yummy just does not do it justice. So, so amazing! Hey there! Just wanted to let you know we featuring you in our Favorite Find Fridays post next Friday over at Whimsically Homemade. We’re using one of your pictures and are linking back to you. If that’s a problem let us know and we’ll remove it immediately. Thanks for your great inspiration!